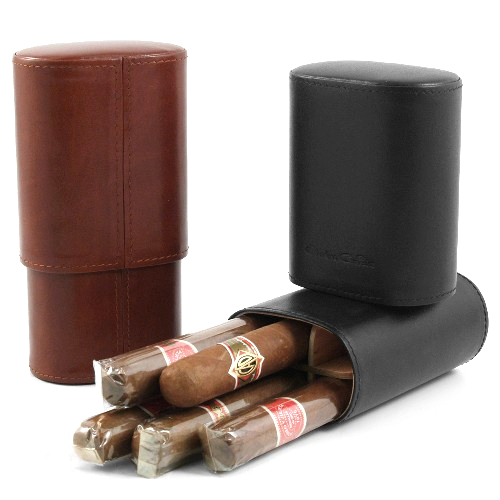 Store your cigars in this stunning Andre Garcia leather cigar case. From the Triomphe Collection this Andre Garcia case will hold up to six cigars. It is made from classic brown leather. To keep your cigars in a perfect environment they are fully lined in Spanish cedar. The removable cedar cross divider can be used to space the cigars or can be removed to allow larger cigars in many configurations. The case with the divider will hold six 50 ring gauge sticks, remove the divider and six 56 ring gauge cigars will fit inside. You can even use this can for the largest ring gauge cigars made, it will just fit fewer sticks. It is one of the most versatile cigar case we have encountered. The friction closure provides a barrier keeping moisture inside the case. Adjustable length allows cigars up to eight inch length and ring size of up virtually any size can be accommodated. The case compacts to as small as five inches.